The World Heritage Sites in India as recognized by the United Nations Educational, Scientific and Cultural Organization or UNESCO are the emblems of India's rich natural and sociocultural heritages. Agra Fort - The Fort of Agra, popularly called the Agra Fort, was the central citadel of the Mughal empire in India. Enlisted under category III of UNESCO World Heritage Sites in India as a cultural monument, this 16th century architectural marvel was built of red sandstones. It is also known as the sister monument of Taj Mahal. The Musamman Burj, where the Mughal emperor Shah Jahan spent the last few years of his life, is also located in this Agra Fort. Ajanta Caves- These 2nd century BCE caves are rock cut Buddhist temples, noted for the engravings of the Buddhist scriptures, the Jataka tales and other Buddhist literature in the stone wall. Further additions and alterations to these caves were made in the Gupta Period in the 6th century CE. Even today people wonder how in those early years, the ancient architects curved out this entire cave temple complex out of solid rocks with their elementary tools. It has been inscribed as one of the UNESCO World Heritage Sites in India. Buddhist Monuments, Sanchi - The Buddhist Monuments at Sanchi in Madhya Pradesh were mostly constructed in the 2nd and 1st century BCE, though the earliest history of the site traces another hundred years back, to the rule of Ashoka. There are more or less 50 monuments in the sanctuary, and all of them were active Buddhist cultural monuments till the 12 century CE. The most historically and culturally important monument at Sanchi is the Sanchi Stupa. It is one of the cultural UNESCO World Heritage Sites in India. Champaner-Pavagadh Archaeological Park - Situated in Gujarat, the Champaner-Pavagadh Archaeological Park includes prehistoric Chalcolithic sites, along with the remains of an early Hindu dynasty. The Pavagadh lake and the adjacent temple is also considered sacred by the Hindus. The remains of the Islamic state of Gujarat in the 16th century are also there. The whole area is a UNESCO World Heritage Site in India. UNESCO had defined it as "a concentration of largely unexcavated archaeological, historic and living cultural heritage properties cradled in an impressive landscape". It comes under the UNESCO World Heritage sites under criteria III, IV, V and Vi. Chhatrapati Shivaji Terminus, Mumbai - The headquarters of the Central Railways, the Chhatrapati Shivaji Terminus (formerly Victoria Terminus) is one of the busiest railways stations in India. Built in 1887-88, this piece of Gothic architecture is one of the landmarks of the Mumbai City. It was designed by the noted architect Frederick William Stevens, in a resemblance to the Saint Pancras Railway Station in London. Later it was inscribed among the UNESCO World Heritage Sites in India. Churches and Convents of Old Goa - The Portuguese colonialists had built a number of churches and convents in Old Goa between 16th and 18th century CE. It was the administrative capital of the Portuguese State of India. The famous churches and convents in Goa include Se Cathedral, the seat of the Archbishop of Goa, the Church of St. Francis of Assisi, the Church of St. Caetano, and the Basilica of Bom Jesus famous for housing the relics of Saint Francis Xavier. Elephanta Caves - Close to the city of Mumbai, the Elephanta Caves in the Gharapuri island consist a plethora of sculpted caves. The Elephanta Caves can be divided into two groups, Hindu caves (which are the larger ones) and Buddhist caves. There is a huge rock cut stone sculpture of the Hindu deity Lord Shiva, cut out from a solid Basalt rock. The sculptures date back from 5th to 8th century CE. However, the historians are not sure about the architects of these wonders. It has been listed among UNESCO World Heritage Sites in India as a cultural site. Ellora Caves - Perhaps the best instance of India's rock cut architecture, the Ellora Caves of Maharashtra consist of 34 continuous rock cut temples, sculpted out of basalt rock cliffs. They were built between 5th and 7th century CE. The first twelve are Buddhist caves, the next seventeen are Hindu and the last five are Jain caves, which also exemplify the religious harmony prevalent in the ancient India over this period. The Ellora Caves are counted among the UNESCO World Heritage Sites in India as a cultural site. Fatehpur Sikri - Fatehpur Sikri stepped into the list of UNESCO World Heritage Sites India in 1986. Literally meaning the Citadel of Victory, Fatehpur Sikri was constructed by the Mughal Emperor Akbar, intended to be the administrative, legislative and military capital of the empire. The Buland Darwaja, commemorating Akbar's grand victory over Gujarat, the famous Jama Masjid, and the tomb of the Sufi saint Shaikh Salim Chishti are also in the complex of the Fatehpur Sikri. However within 14 years the citadel was abandoned due to scarcity of water and at present this ghost town is a tourist destination. Great Living Chola Temples - The Chola temples that exist and are used till date were built by the Chola rulers, mostly Raja Raja Chola, back in the 11th and 12th century CE. They are enlisted among the cultural UNESCO World Heritage Sites in India. Some of the great Chola temples include the Brihadishvara Temple at Thanjavur, yet another Brihadishvara Temple at Gangaikonda Cholapuram as well as the Airavateshvara Temple at Darasuram. The Lion Well or Simhakeni at the Gangaikonda Cholapuram is also a popular tourist attraction. Group of Monuments at Hampi - The archaeological remains of the Hampi monuments subsumes the ruins of the former capital of the Vijayanagara kingdom, the city of Vijayanagara. These monuments of Hampi are presently located near the Hampi town in the modern Karnataka. The Virupaksha temple at Hampi, along with the rest of the monuments, was built between 14th and 16th century CE. The monuments of Hampi were canonized as cultural UNESCO World Heritage Site in India in 1986. Every rock, monument and pathway in the 14th Century Ruins of Hampi, scattered over about 26 square kilometers, whispers the tale of the bygone glory and beauty to the tourists. Group of Monuments at Mahabalipuram - Mahabalipuram or Mamallapuram was a 7th century CE port city of the ancient South Indian Pallava dynasty. The Chariot or Ratha Temple of Mahabalipuram, the Shore Temples, the Krishna Mandapam, the Mahishasura Mardini Mandapam, cave sanctuaries like the Vishnu Cave Temple as well as the rock relief of Descent of the Ganges, alternatively known as Arjuna's Penance, are some of the world famous temples and tourist attractions in Mahavalipuram. Arjuna's Penance is the world's largest open air rock relief in the open air. Mahabalipuram was inscribed as UNESCO World Heritage Site in India in 1984. Group of Monuments at Pattadakal - Pattadakal is a town in the present day Karnataka, which was the seat of the ancient Chalukya rulers. There are nine Hindu temples at Pattadakal along with a Jain shrine, including the Virupaksha Temple, the Sangameshvara Temple, the Mallikarjuna Temple, the Kashivisvanatha Temple, the Kadasiddhesvara and Jambulingeswara temples and the Galganatha Temple. The Virupaksha Temple, built in c. 740 by Queen Lokamahadevi. Rest of the temples also date back to a timeline between 6th and 8th century CE, all of them being constructed by the Chalukya rulers. The Pattadakal monuments were added to the list of India World Heritage Site by UNESCO in 1984. Humayun's Tomb, Delhi - Humayun's Tomb in the Old Delhi is perhaps the first major instance of the Mughal Architecture in India. Constructed a century earlier, it can be called the predecessor of the world famous Taj Mahal of Agra. Both Humayun's Tomb in Delhi and Taj Mahal at Agra share the same architectural principles of a colossal dome supported by pillars. Humayun's Tomb is also the first of the garden tombs constructed in India. It was declared an UNESCO World Heritage Site (cultural) in 1993. The declaration fast multiplied tourism here, as well as prompted the Archaeological Survey of India for extensive restorations. Jantar Mantar, Jaipur - The Jantar Mantar in Jaipur, Rajasthan, is yet another architectural marvel of India. These huge astronomical instruments were built by Maharaja Jai Singh II between 1727 and 1734 CE. The Jantar Mantar observatory include 14 fourteen major geometric devices. These were used for measurements of time, prediction of eclipses, tracking of the orbit of the earth, location of stars, declinations of planets, and other astronomical things. The largest of the lot is known as the Samrat Yantra, literally, the Giant Equipment. It is a 90 feet high sun dial that told the time of the day, angled and adjusted according to the altitude of the city of Jaipur, that is, 27 degrees. In 2010, this place was declared an UNESCO Heritage Site in India. Kaziranga National Park - The Kaziranga National Park, formerly the Kaziranga Wildlife Sanctuary, in Assam proudly houses world's largest population of the Great Indian One-Horned Rhinoceros. The wild Asiatic water buffalo, Eastern Swamp Deer, gaur, sambar, Indian Muntjac, wild boar and hog deer are some of the other habitants of the Kaziranga National Park. It was also declared a tiger reserve in 2006, boasting a high tiger density. The Kaziranga National Park was declared a natural UNESCO World Heritage Site in India in 1985. Keoladeo National Park - The Keoladeo National Park in Bharatpur, Rajasthan, is widely known for the various species of birds that are seen here. Originally a duck hunting reserve for the royal family of Bharatpur, it got the status of a bird sanctuary following India's independence and the annexation of native states to India, in 1956. The perfect heaven for the bird lovers, bird watchers and wildlife photographers, Bharatpur Bird Sanctuary alias Keoladeo National Park witnesses a congregation of more than 360 species of birds during the winter. It was enlisted as a natural UNESCO World Heritage Site in India in 1985 under Category X.
Khajuraho Group of Monuments - The Khajuraho monuments in Madhya Pradesh, India, were the works of the Chandela rulers. A great example of the harmony of Hinduism and Jainism as well as a fusion of the two schools of architecture, the Khajuraho temples were canonized as UNESCO World Heritage Sites in India in 1986. The history of the Khajuraho Temples range from the middle of 10th century CE to the middle of 11th century CE. There were originally 85 temples, however today only 22 of them survive the test of time. Mahabodhi Temple Complex at Bodh Gaya - Constructed over a large area of more or less twelve acres, the Mahabodhi Temple Complex at Bodh Gaya or Buddha Gaya has immense archaeological and cultural importance. It is one of the sacred pilgrim places of Buddhism as it marks the seat of the enlightenment of Gautama Buddha. The first temple at Bodh Gaya was constructed by the Mauryan emperor Ashoka in 3rd century BCE, which do not survive till date. The shrines presently seen there were built in the 5th and 6th century CE. It is the oldest extant temple of the ancient India. 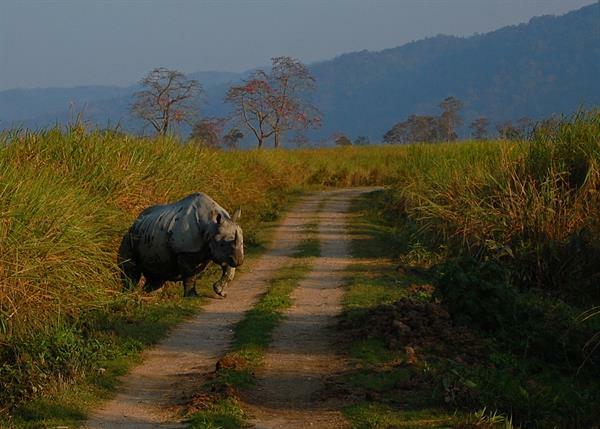 Manas National Park - Manas National Park, formerly the Manas Widlife Sanctuary, is located in the Assam district in the foothills of the Himalayas. However, a part of this national park is extended into the territories of Bhutan. It was declared as a wildlife sanctuary in 1928, and was designated as one of the natural UNESCO World Heritage Sites in India in 1985. The major fauna of the Manas National Park include tiger, Golden Langur, Wild Buffalo, Hispid Hare, Pigmy Hog, Capped Langur, Indian one-horned Rhinoceros, Elephant, Gaur, Hog Deer and more. It also houses more than 450 species of birds, most of them migrating from the north during the winter. Mountain Railways of India - The Mountain Railways of India indicate a team listing of the Darjeeling Himalayan Railway, the Nilgiri Mountain Railway and the Kalka-Shimla Railway as UNESCO World Heritage Sites in India. Nevertheless, India has 5 mountain railways altogether, all build during the colonial period, and all of them are in use even today by the Indian Railways. Apart from the above three, the other two mountain railways of India are the Kangra Valley Railway in Himachal Pradesh and the Matheran Hill Railway in Maharashtra. The Darjeeling Himalayan Railway was first to be added as a UNESCO World Heritage Site in 1999, with the rest following up in 2005 and 2008. Nanda Devi National Park and Valley of Flowers - The Nanda Devi National Park and the Valley of Flowers are seated in the high ranges of the Garhwal Himalays in the Chamoli district of the Indian state of Uttaranchal. The Asiatic black bear, snow leopard,brown bear and blue sheep are some of the noted fauna of the Nanda Devi National Park. Also, the view of the peak of Mount Nanda Devi will win the heart of any human being for sure. It was added as an UNESCO World Heritage Site in 1988. Also, together the Nanda Devi National Park and the Valley of Flowers constitute the Nanda Devi Biosphere Reserve, which also boasts a proud place among the UNESCO World Network of Biosphere Reserves. Qutub Minar Complex, Delhi - The Qutub Minar Complex in Delhi mostly has Islamic Mughal pieces of architectures, with an ancient iron pillar of some King Chandra being the only Hindu work. Apart from the iron pillar famous for never catching rusts, the sanctuary consists the 238 feet high sandstone tower called the Qutub Minar, the incomplete Alai Minar, the Alai Darwaza, and the Quwwat-ul-Islam mosque. Alternatively spelt as Qubbat-ul-Islam, it is the mosque is the earliest extant mosque in India. Rock Shelters of Bhimbetka and cave paintings- Located in the foothills of the Vindhya Range in the state of Madhya Pradesh, the Rock Shelters of Bhimbetka consists of a cluster of five rock caves, used as natural shelters by the prehistoric men. The caves boast prehistoric Mesolithic paintings. The caves date back from circa 100000 BCE in the late Acheulian period to 10th century CE. The rock shelters of Bhimbetka including the cave paintings were declared as one of the UNESCO World Heritage Sites in India in 2003. Sun Temple, Konark - Located in the Puri district of the Orissa state, the Konark (or Konarak) Sun Temple is constructed in the shape of the chariot of the Sun God, Surya or Arka. The chariot has 24 wheels and is pulled by 6 horses. The Sun Temple of Konark was constructed by King Narasimhadeva I of the Eastern Ganga Dynasty in the 13th century CE. One of the most famous temples of India, The Konark Surya Mandir or sun temple was added to the list of UNESCO World Heritage Sites in India in 1984 under categories I, III and VI. Sundarbans National Park - Spread over the estuaries of the river Ganges and Padma along the coastlines and hinterlands in India and Bangladesh, the Sundarbans is the largest mangrove forest of the world. The Indian part of the Sundarbans is known as the Sundarbans National Park. Sundarbans house the widest species of the mangrove flora. Also, it is the natural habitat of the world famous Royal Bengal Tiger, the estuarine crocodile, and the critically endangered Gharials. Sundarbans are easily accessible from Kolkata and Dhaka, the capitals of the Indian state of West Bengal and Bangladesh respectively. It was added as a natural UNESCO World Heritage Site in 1982. Taj Mahal, Agra - One of the Seven Wonders of the World as well as the most visited and most photographed Mausoleum on the earth, the Taj Mahal of Agra perhaps needs no introduction. It was built by the Mughal emperor Shah Jahan in the loving memory of his third wife Mumtaj Mahal, between 1631 and 1648 CE. The chief architect of Taj Mahal was Ustaad Ahmad Lahauri, the imperial architect of the Mughal court. Taj Mahal was declared an UNESCO World Heritage Site in India in 1983. It is one of the most visited tourist destinations in India. The Red Fort Complex, Delhi - The Red Fort Complex or the Lal Qila was built in the 16th century CE towards the north of Delhi by the Mughal emperor Shah Jahan, intended to be the main fortification of his new capital city, Shahjahanabad. Red Fort stands aloof among other pieces of Mughal architecture as an unmatched blend of the Persian, the Timuri and the Indian architectural styles. Until the exile of the last Mughal emperor Bahadur Shah Zafar by the British in 1857, the Red Fort complex continued to serve as the capital citadel of the Mughal rulers. In this article you will find information about what are the must see in the Sundarbans, how to reach and what to avoid while taking a tour at Sundarbans. As a nearby tourist place Sundarbans have so much to offer you just note down the tourist lodge adresses, contact numbers at Sundarbans from this article. A very well written article. It helped my daughter in completing her school project. Thanks to the author. I am a student of Class 5th. This page is very good. Children can learn very interesting, amazing and knowledgeable information. Thanks to the author to give us such an information. This is very good article. Students / children can learn very interesting, amazing and knowledgeable things too. Thanks to the author to give this such a good information to me and other students as well.